I am long overdue for sharing some travel posts. 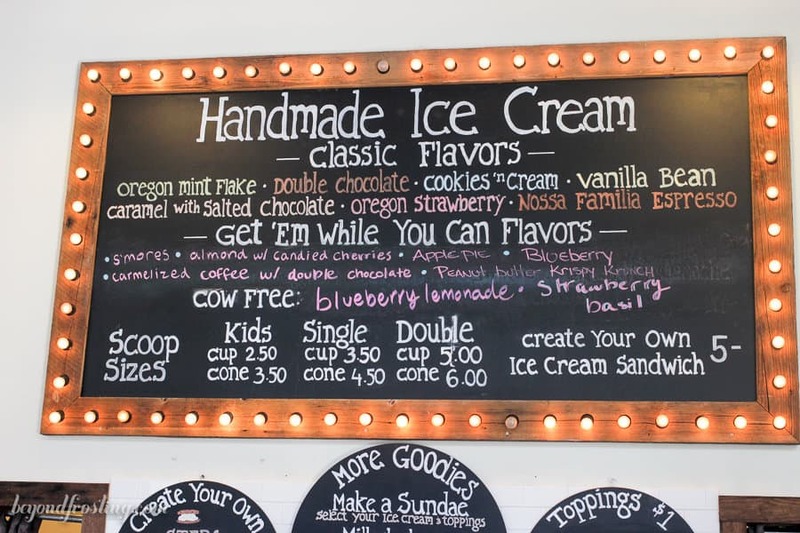 So in the spirit of labor day, let’s have a little fun with my Beyond Frosting Eats series and talk all ice cream in Portland Oregon. When I tell people that my bestie and I are meeting up in any particular city for a girls weekend, they usually ask me what our plans are. My reply usually entails something like “nothing, just eating” as I watch the puzzeled look on their face. “No really, we are just going to eat our way through the city”. Okay sure Julianne. Not only do I love food, but my food blogging friends definitely love food. So when I called Lindsay and asked her if she wanted to come visit now that she and I were both done with our cookbook, I was delighted when she agreed. Then I suggested we actually meet up somewhere because where I live isn’t exactly exciting. Lindsay has never been to Portland I was dying to go back there because I knew how many amazing restaurants they have! 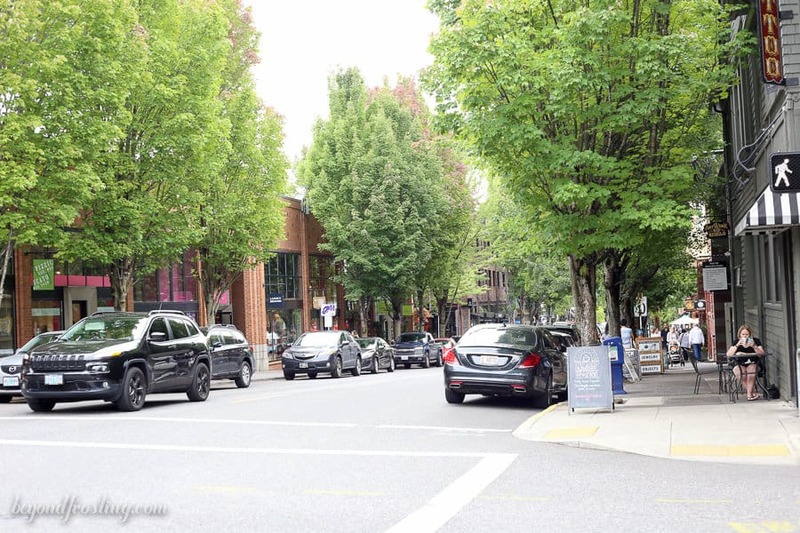 A few weeks later I was packing my stretchy pants and off to Portland we went. You might remember the last time I was in Portland for the Indulge conference, I asked my boyfriend to accompany me since I knew he likes to eat too. Can you say soul mates? So I had a few restaurants I had been too that I know Lindsay would enjoy. The rest of our stops were purely the results of hours of Goggle searching and Instagram stalking. I knew we wouldn’t make it every place on my list, because I think it’s unhuman for any person to eat that much over the course of 2 ½ days but we made a very solid dent! So I am going to break up this post into savory and sweets and you guys can decide what is your favorite. 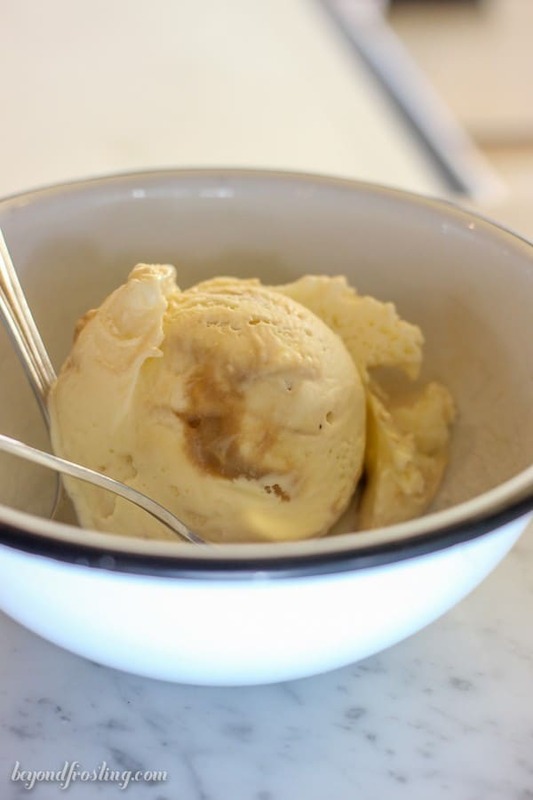 Today we’re talking all things ice cream. I don’t think I’ve ever eaten so much ice cream in one weekend! 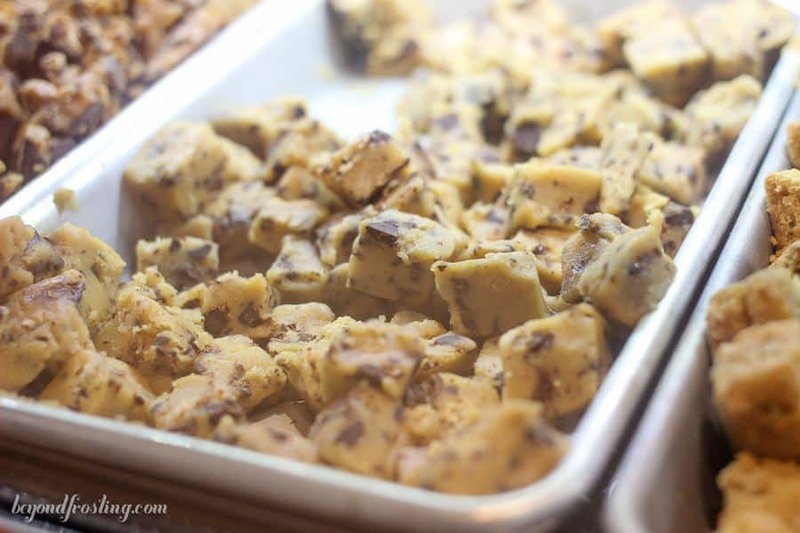 Eb Bean: Known for homemade organic frozen yogurt, non-dairy vegan and gluten-free yogurt. 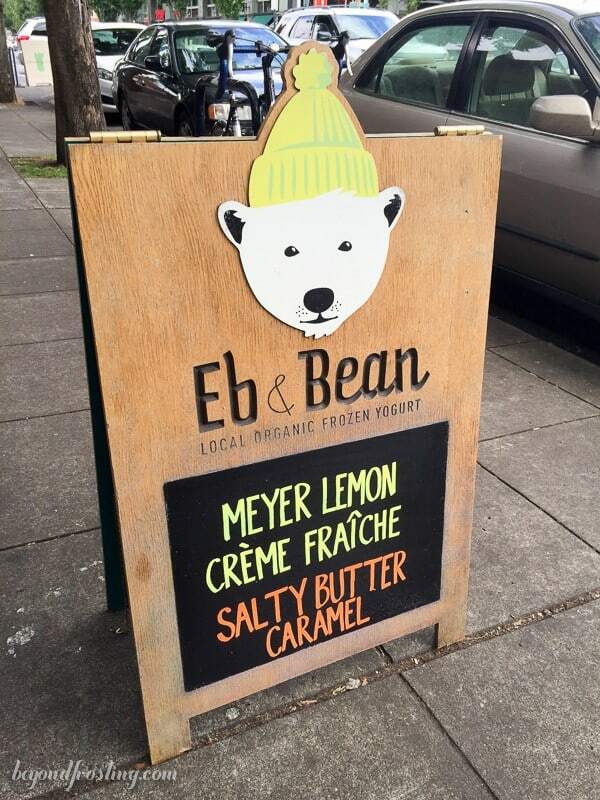 Our first stop was Eb & Bean, a spot that Lindsay found for soft serve ice cream. It’s located in the Northeast off Broadway. It was a little out of our way but well worth the trip. They offered 7 different flavors, two of which are staples and 6 rotating flavors. They always offer vanilla and chocolate. The seasonal flavors were meyer lemon crème and salty butter caramel. 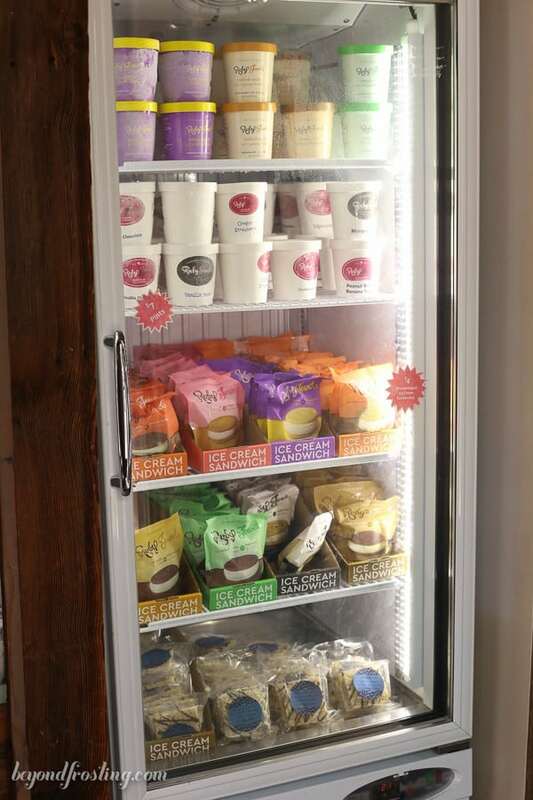 They also offered 3 different vegan flavors made with different types of milk: coconut, almond and cashew. The cashier was SO friendly and let us try every flavor. To my surprise, my favorite was the vegan chocolate hazelnut pudding. Let’s be honest, I am not one to opt for vegan anything, but this was straight up awesome, creamy and strikingly similar to what I would expect from a chocolate soft serve. They had all sort of toppings with lots of options from local bakeries like cookies and brownies. I opted for cold brew bourbon sauce and it did not disappoint. I will be recreating this ASAP. You guys, I was blown away by this cute little shop! Fifty Licks: known for hand-made custards the traditional way: cream, sugar and egg yolks. 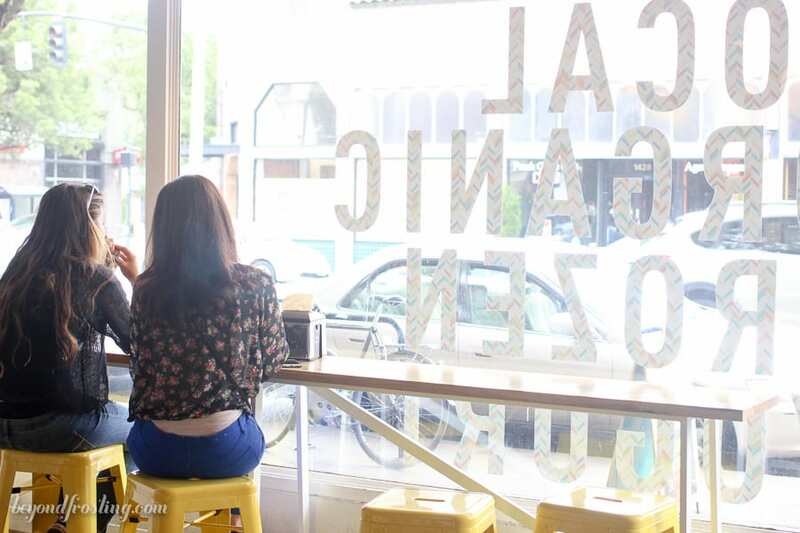 This retro inspired ice cream spot is located in the southeast corner of Portland. This had a very family-friendly vibe with unique flavors such as Arnold Palmer, Blood Orange Creamsicle and a boozy butterscotch. You can even bet a beer ice cream float. We were quite full by the time we got to Fifty Licks, so we sampled a couple of flavors and split a scoop of the boozy salty butterscotch. I definitely could tell this was a custard based ice cream with the rich and creamy texture. I am coming back for more! 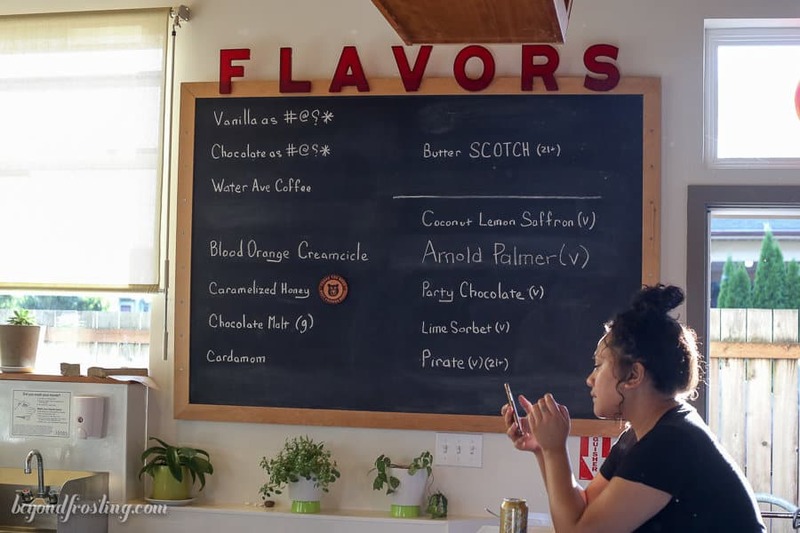 Salt and Straw: One of Portland’s most well-known ice cream shops with rotating seasonal flavors incorporating local Portland vibes. 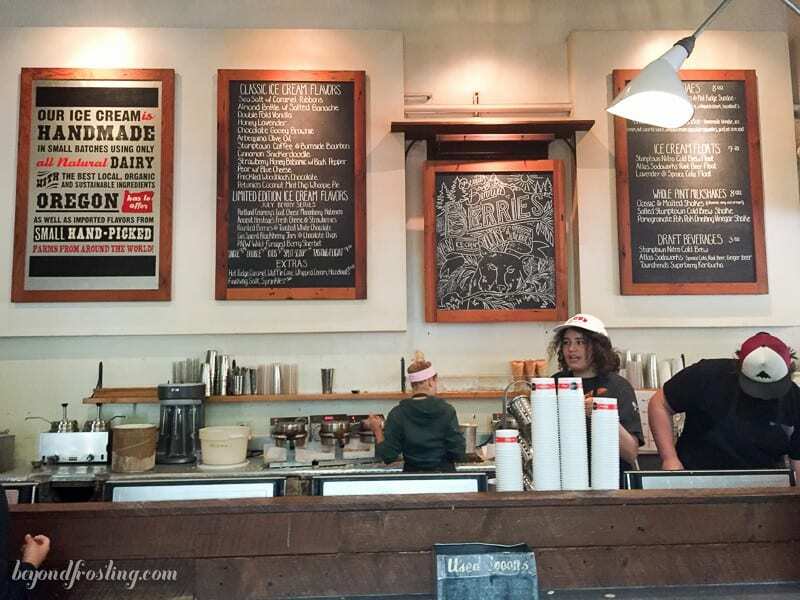 No trip to Portland is complete without a trip to Salt and Straw. 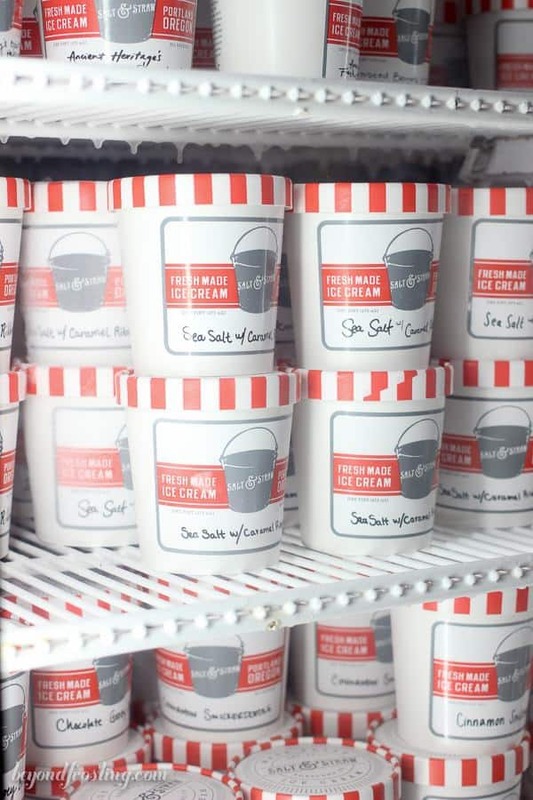 Thankfully if you don’t live in Portland, Salt and Straw has opened some locations in LA and you can also order online, but it does come with a price tag. This was not my first trip to Salt and Straw, my boyfriend and I went twice the weekend we visited because it is THAT good. He’s obsessed with the Snickerdoodle Cookie and so am I! 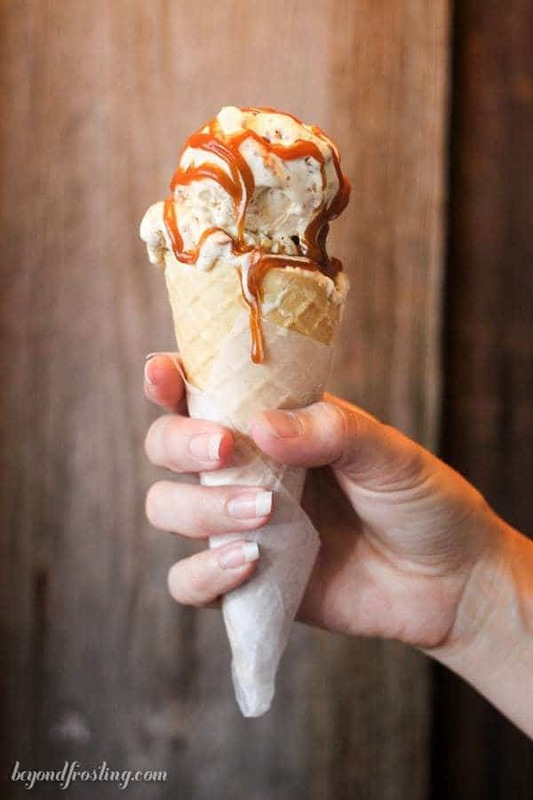 Once you walk into their storefront, you are pleasantly over whelmed with the aroma of homemade waffle cones, which are a must try. 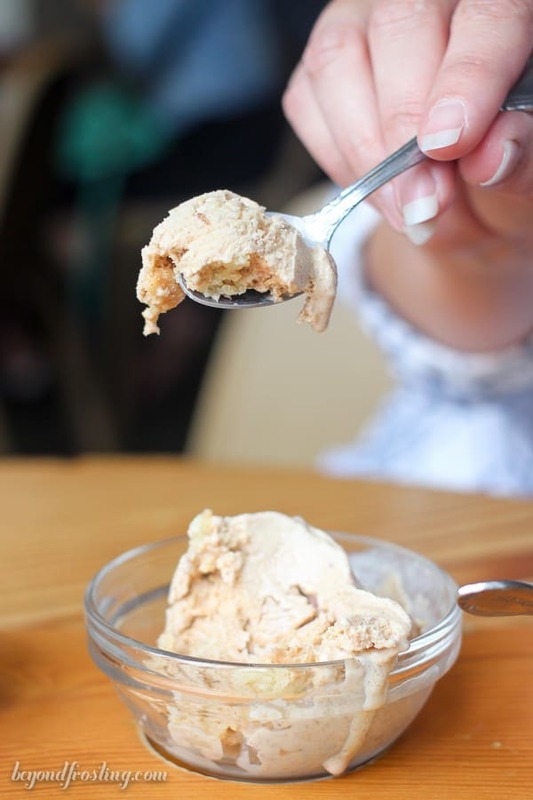 One of my favorite things about visiting Salt and Straw is that you can taste ALL the things. They rotate out 5 or so monthly flavors. Just last month was their farmers market series and I made some Chocolate Zucchini Bread Ice Cream after seeing it was one of their flavors last month. 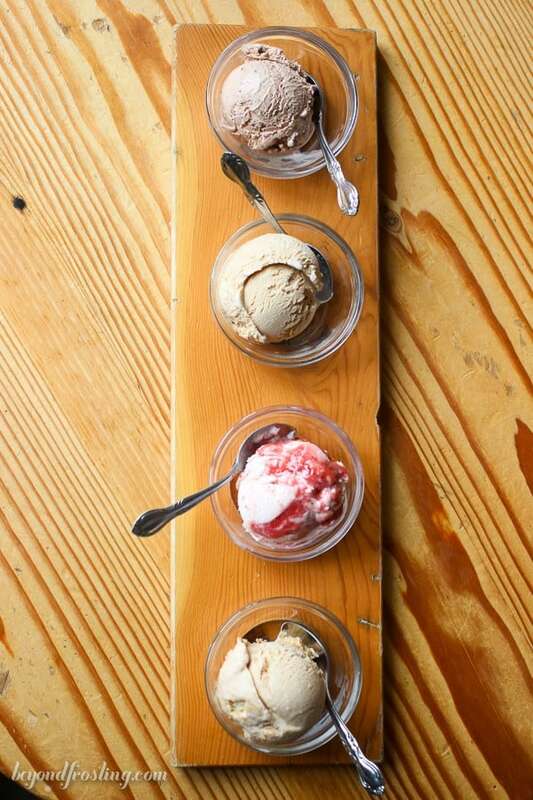 We got a “flight” of ice cream which is 4 different scoops, and perfect for sharing. 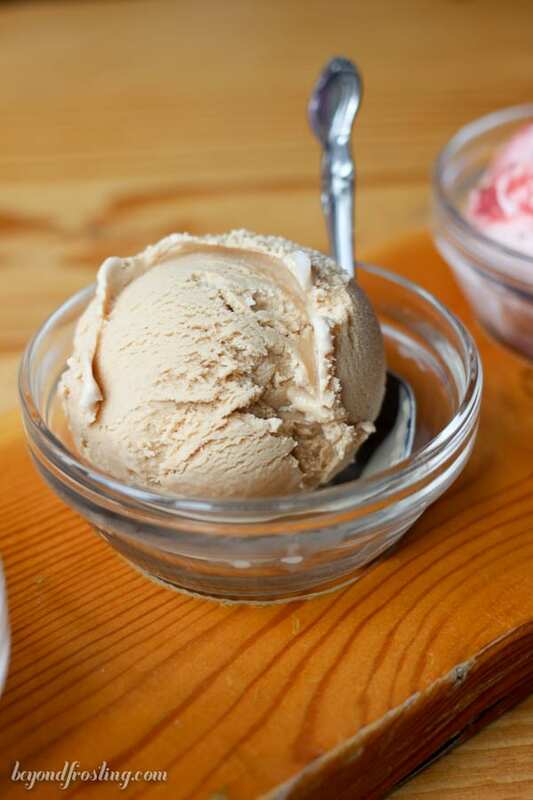 Besides the Snickerdoodle Cookie, I know we got one of the seasonal berry flavors, we also got the Freckled Woodblock Chocolate, which is a salty chocolate ice cream, and I wanna say we got the Stumpton Bourbon Coffee Ice cream. I guess I should have written it down . Sorry guys! Try and go at an off time, because I’ve waited in line up to and hour! Local tip: skip the line and go inside to grad a couple of pints to split. They have some at the register and some at the back of the store. 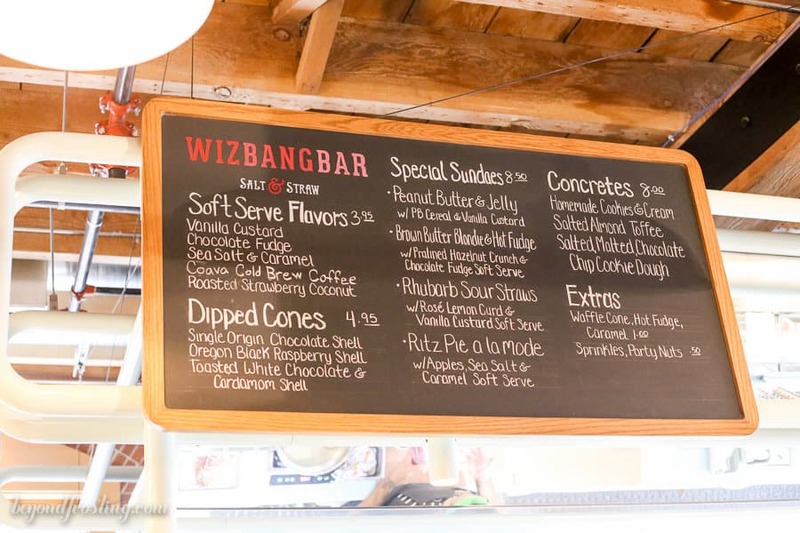 Whiz Bang Bar by Salt and Straw: Classic soft serve with a Salt and Straw Twist. 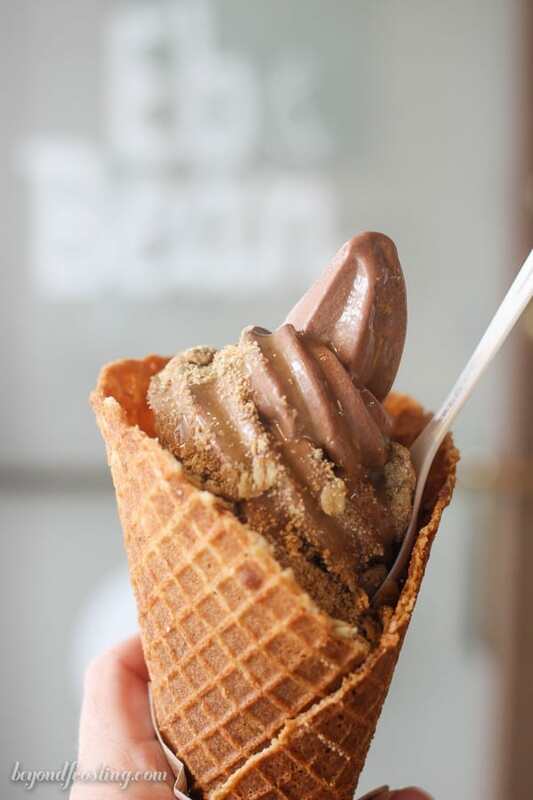 So we managed to also make the trek down to the new Wiz Bang Bar, Salt and Straw’s new soft serve ice cream. It’s near the waterfront and quite a nice way to walk off all the ice cream we ate. 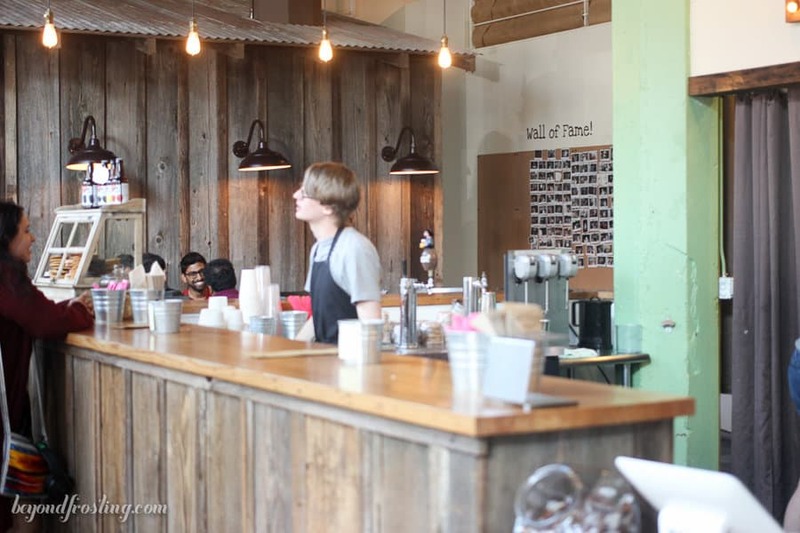 It’s inside the Pine Street Market place, which is an indoor eatery with multiple order-at-the-counter restaurants inside. I love the décor there, but it was quite busy. I love love love soft serve and was so excited to try it. I really wanted a hand-dipped cone but I couldn’t resist the sundae. 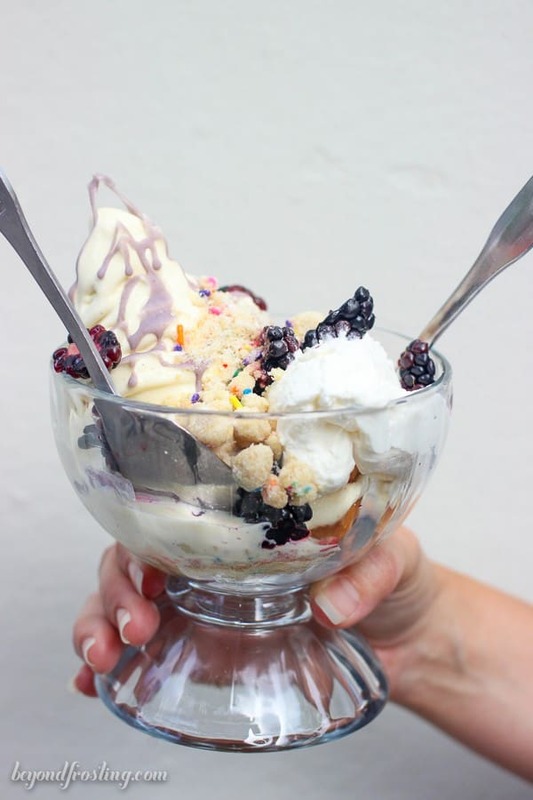 We ordered the special, Blackberry Birthday Cake Sundae. It was a warm piece of frosted cake topped with vanilla soft serve, blackberries, whipped cream and a lavender white chocolate magic shell. Similar to most soft serve bars, there is a variety of toppings to choose from. That’s the best part right? 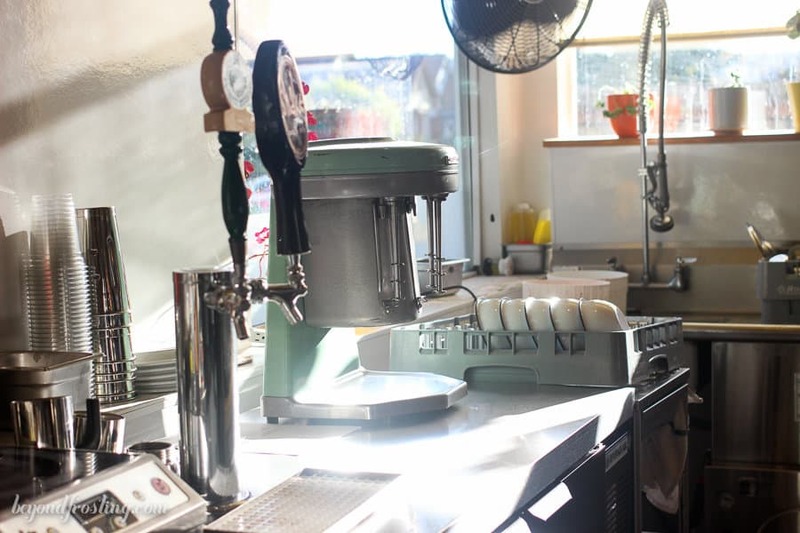 Ruby Jewel Scoops: Locally sourced ingredients for hand crafted ice cream. Another must-stop ice cream spot, Ruby Jewel has multiple locations across the city. 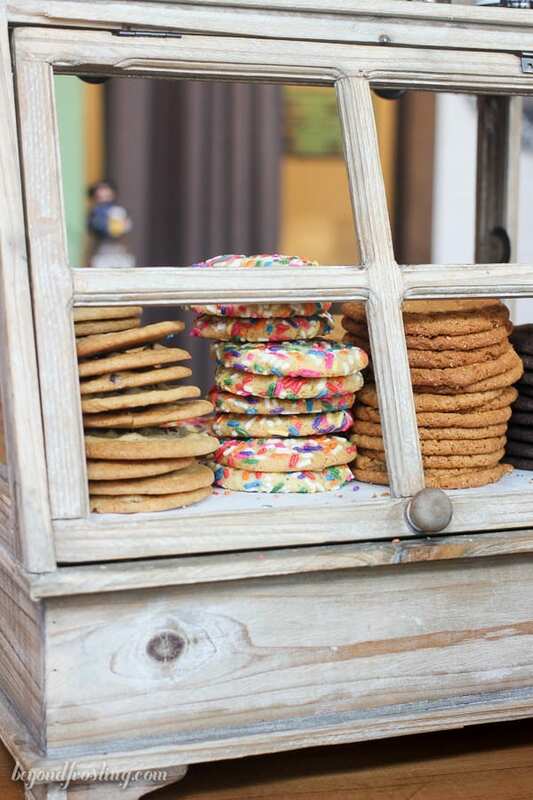 Or if you stop in the shop, you can create your own ice cream sandwich with their fresh made cookies. It’s nearly impossible to walk by and not be overcome with a craving for ice cream. I love their natural wood décor inside. While I really wanted to try one of their ice cream cookie sandwiches, I just didn’t have the room for it. I opted to try their apple pie ice cream with a salted caramel drizzle. This ice cream did not disappoint. There was even chunks of pie crust in the ice cream, heck yes! Great post. “Blackberry Birthday Cake Sunday”. I am going to remember this come May 2017 if I can wait that long. Portland. 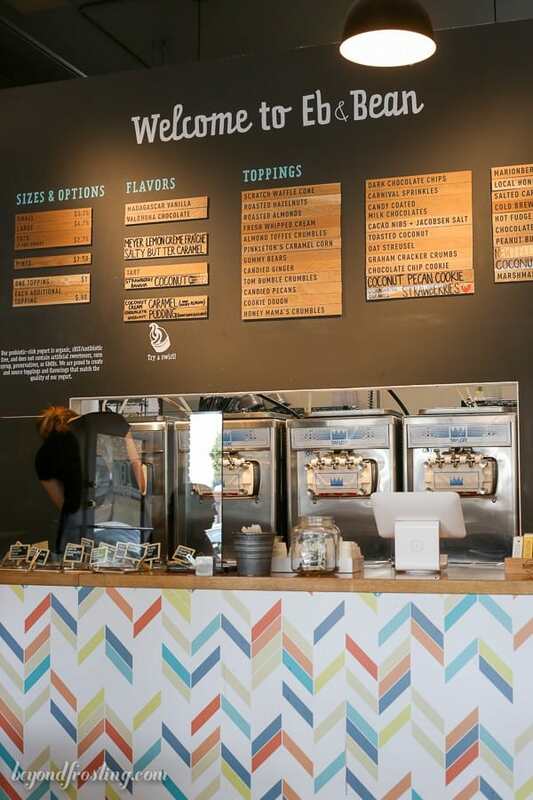 An ice cream lover’s paradise. oh, man, I need to go to Portland!!! All these ice cream shops look so amazing! Now I want to go to Portland for the ice cream!